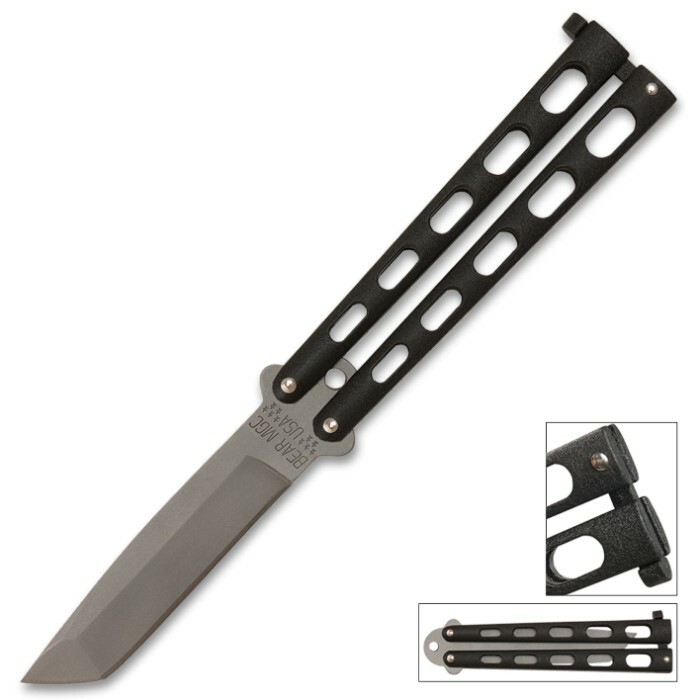 Bear Armor Piercing Black Butterfly Knife | BUDK.com - Knives & Swords At The Lowest Prices! This Armor Piercing Butterfly knife by Bear and Sons Cutlery is light and durable and a perfect fit for anyone! This item cannot be sold in CA, HI or NY. Not bad, not that great, either. 3.5 star total....not impressed by any stretch of the imagination. Pros. -Great flipping, nice weight, and it feels fairly balanced. *158.4g weight* -Blade is nice and thick. -Quality of the handles and blade is pretty darn good Cons. -Blade length is advertised at 5" but is actually only 4" measured from tip to the end of the sharpened section. -Not a true tanto blade as one side is FLAT! -Epoxy coating is cheap and starts rubbing off the first time you flip it open. -Laser engraving is almost impossible to see on the epoxy coated blade. -Latch doesn't stay latched and the knife comes open in my pocket. 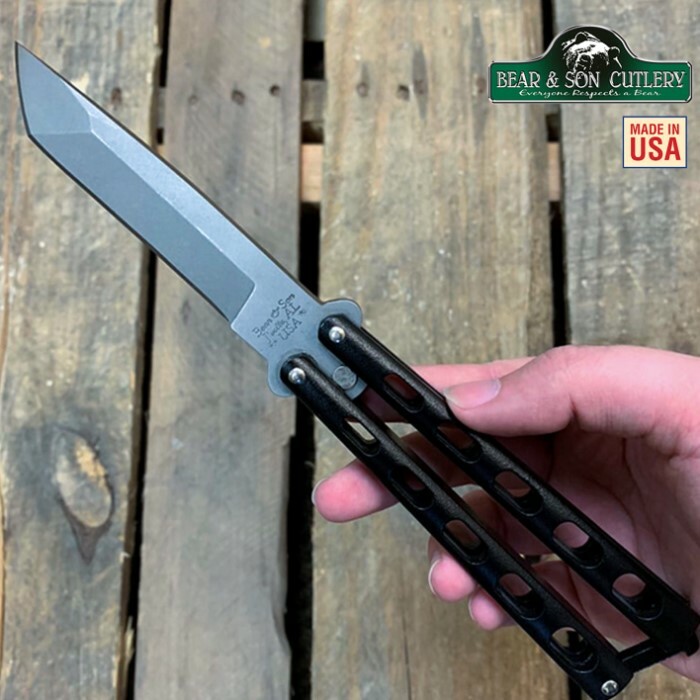 I went into this with the expectation of a true tanto blade, a coating that didn't flake off, and an engraving you could read....Trueswords offered an RMA but I kept it as it was already personalized and I hate dealing with returns. I am satisfied enough to keep it but I can't really say I love it or that I feel it was worth the $50+ I spent on it after shipping and engraving. This is more of a $35 knife in my humble opinion. A very good knife, came *sort of* sharp, the only problem I have had so far is the latch, the latch has no latch guard, so if you're flipping it, the latch may go all the way down and smack the blade, I just put a rubber band on it too guard it. Can easily do tricks like the "zen rollover" and the "y2k rollover". Bought this knife as a nice first butterfly. Had it for a few months and it worked well on easy tricks. Once I started trying harder tricks, specifically "The Trebuchet", the bite handle literally broke in half near the tang pin. Was really disappointed because I use it almost everyday for fun and had gotten good with it. I purchased this butterfly knife with higher expectation then what I received. It is well balanced feels good in your hands, although I do feel it is a little over priced for the quality of the blade itself just because its flat on one side. I got this butterfly knife/balisong because i wanted one less that $100 and that was good quality. this is an awesome knife. Pros: sharp blade, durable handles and lock catch... Cons: the other side of the knife on the product picture is flat. on one side the blade looks like a cool Tanto blade... but flip it and its just flat. also when i got this in the mail, it got out of its box and felt and looked like it had been dipped in oil. maybe its just me idk but make sure to clean your knife when you get it.